These days, Sally is a seasoned performer in contemporary classical music and usually performs new works, often premieres, in the course of every season. She has taken Nicole Tibbels' advice and 'got over the resentment' about the material being so hard to learn for someone without perfect pitch. One composer recently told her she had proved an unperformable piece could be sung.... Many composers have written for her: she has performed the premiere of works by Judith Weir, Nicola LeFanu, Francis Shaw, Julian Broughton, Tim Porter, Andrew Lovett and many others. Howard Skempton is writing a setting of a new poem by Alexander McCall Smith specially for Sally's voice. Details of performances are on her news page. 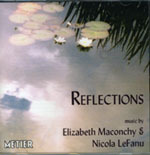 She has performed many times with the group Okeanos with whom she recorded LeFanu's cantata Mira Clar Tenebras on the Metier label on a disc called Reflections. It can be obtained from www.metierrecords.co.uk. With Okeanos she performed at the Three Choirs Festival in Hereford and at the Cambridge Festival and on a Cutting Edge tour. Sally made a recording of Ancient Greek Songs for KPM EMI to coincide with the Athens Olympics. The songs are accompanied by lyra or a computer-generated reconstruction of Greek instruments. The composers Francis Shaw and Robert Foster worked on the reconstruction of the music from original sources. The folk-inspired mythic operas of Tim Porter have been engaging her attention recently and she performed a concert of his work entitled 'The Green Branch' at Chipping Norton Theatre last year. The show is based on the legends of Finn Macool and Gawain. A further entertainment is in preparation with the story teller Michael Dacre.